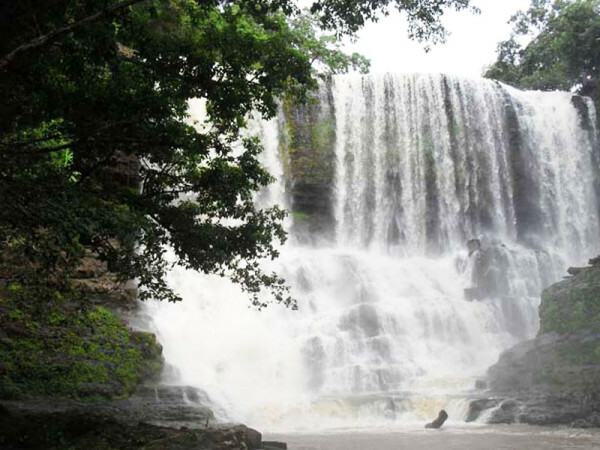 First Stage: The waterfall fall is 8 to 12 meters high and 15 meters wide in rainy season and 10 to 15 meters wide in dry season. 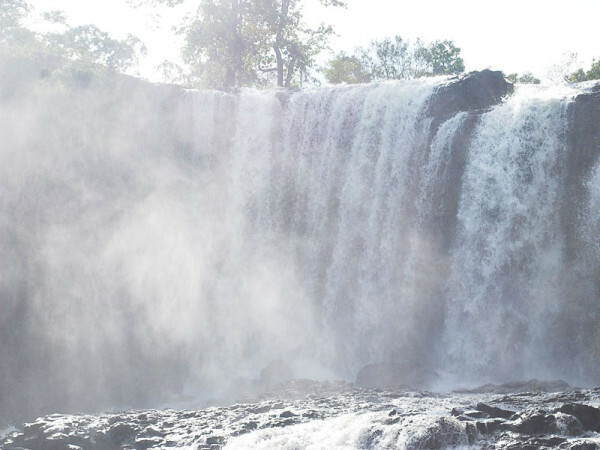 Second Stage: The waterfall fall is 15 to 20 meters high and 20 meters wide in rainy season and 18 to 25 meters high and 13 meters wide in dry season. The second stage is 150 meters from the first stage. 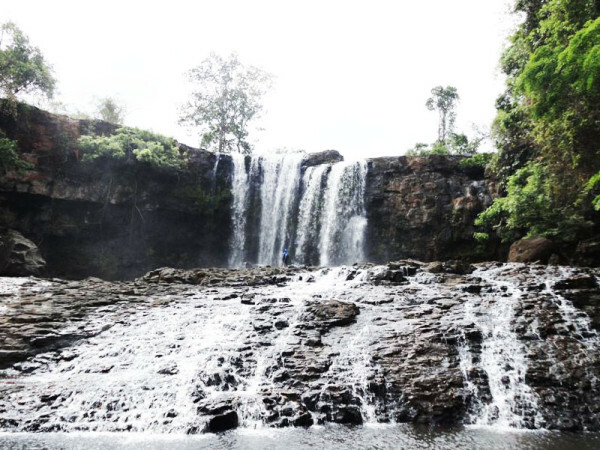 Third Stage: The speed of waterfall is faster than the second stage. This stage cannot be reached because it is in the thick forest. There are no marked paths and dangerous wildlife inhabits the area. 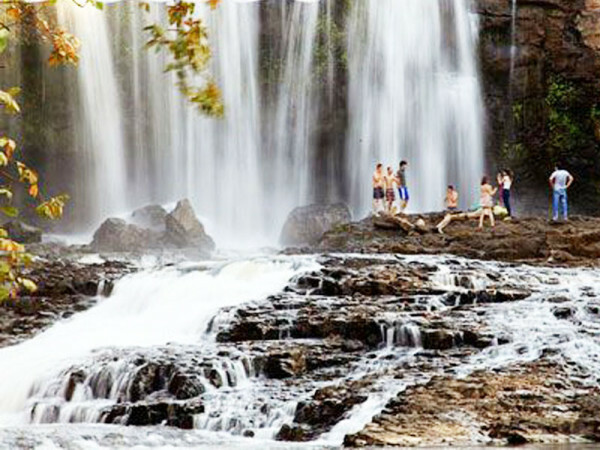 The double-drop waterfall is very popular with the locals who use it as a bathing and picnic spot. 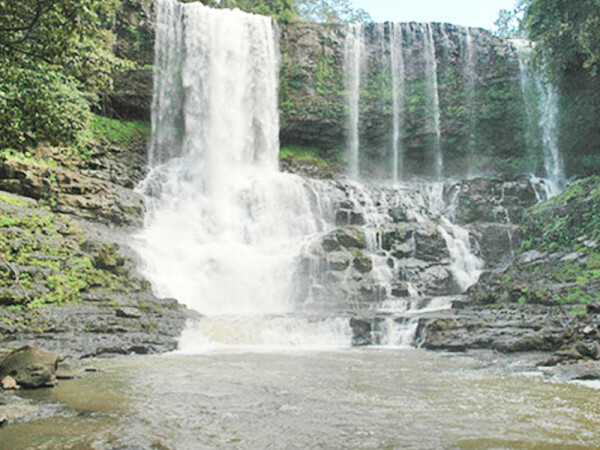 Its top level is around 10m in height, and the lower level drops down 25m to the gorge. 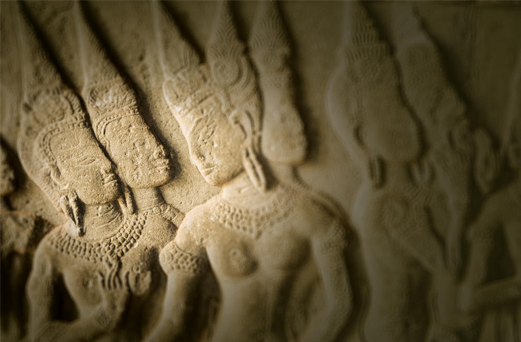 It is in a scenic and pristine setting and offers great photo ops. 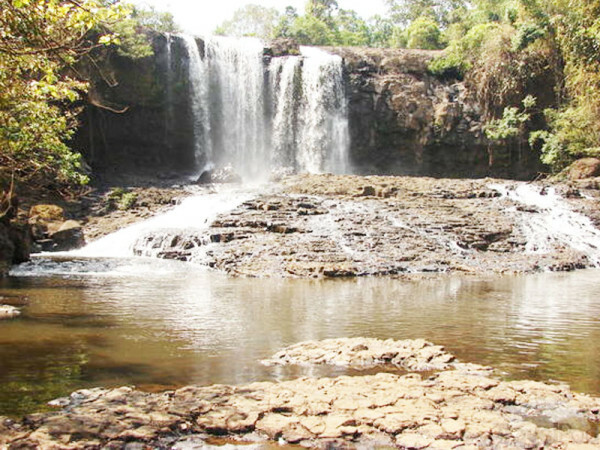 Nearby is the ethnic Phnong village called Pichinda which has a small guesthouse. Some snacks are available at the falls, but bring food if you would like something more substantial. Then we head northeast to Bou Sra. We never rode north on this road before and I am surprised that right behind the first hill it is getting rougher than most we have seen yesterday. We cross a small river on an improvised bridge and are charged 500 Riel each by a bunch of kids. After that the road is getting somewhat smoother but still requires a lot of attention. There are deep grooves in the road, most likely left behind my heavy cars. Once you get into one of those it leaves you with only very few options other than just following it hoping not to get stuck. Yet the ground is solid and provides good grip for the tires. We keep going and after some time we do not see settlements anymore. The forest is relatively dense and in some places impenetrable. Both of us have to restart the bike a number of times and while we proceed with moderate speed it remains a challenge in many places to maneuver those relatively heavy bikes. The way I start this bike many times is I put it on the stand, climb on the moto and start it from this relatively comfortable position, before I flap the stand and go. However, I realize that the stand is about to break off and can hardly support the bike anymore. The road is getting tougher; there are many rocks and countless obstacles, sometimes forcing us to ride next to the road. And hills are pretty steep in some instances. Overall we move quite slowly. After about 40 minutes we have a break. I try to figure how Pongro is riding down those hills and ask him. I learn that he controls the speed entirely with the clutch. I am about to suggest using a lower gear. To demonstrate how he does it he takes the clutch clever and holds it tight. Oddly, at precisely this moment the clutch cable breaks. I does not take us long to realize that it is impossible to ride this bike without clutch. Ironically, today is the first day we go without the heavy set of tools and spare parts we usually carry and which includes a clutch cable. Pongro is still confident that we can manage to fix the bike here. Once in while people pass on small, old Honda’s, sometimes badly overloaded but always very skillfully finding the way between all those rocks. We learn that the way to Bou Sra is still longer than the way back to Sen Monorom. Furthermore the road is getting tougher from here. And it is very unlikely we find somebody there who can fix the bike.One of those guys stops for some time and Pongro borrows some tools and wire in order to try fixing the moto. The Phnong guy joins and for some time they try hard. However, it is becoming increasingly clear that this won’t work out.